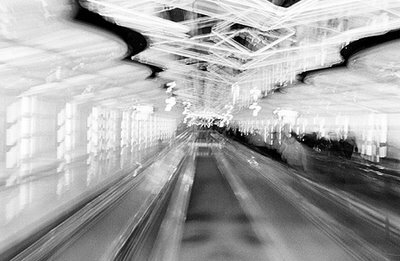 Chicago IL Photographer: Do psychic photographers ever take a bad photo? I just found this fascinating ad for photography services from a photographer named Dorothy Perry. I am a calm, easy-going local family and event photographer known for my beautiful, spontaneous shots of very personal life events. 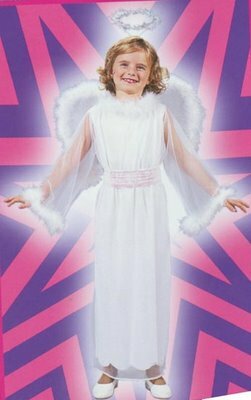 In 2005 this work awakened a psychic ability whose focus makes subtle, extremely different portraits and documentary of children, toddlers and the hard-to-photograph. Intuitive and psychic energy readings are also available by appointment. Wow. That IS extremely different! I'm familiar with some unusual areas of photography. I've heard of ghost photography (I posted a ghost photo in a previous entry). I've even heard of aura photography. But I'd never heard of psychic photography before now. After reading Dorothy's ad, I wondered if she used her psychic ability to photograph things that children see in their imagination. My own imagination conjured images of children dancing with leprechauns and Sasquatch, so it was with some disappointment that I only found beautiful portraits of babies and children. Still, I think Dorothy should offer aura photography as an option. I'm proud of my child photography, but Dorothy's ad inspired me to find an "extremely different" portrait of my own. In the process, I dug up an old photo that wasn't intended to be a portrait at all. I shot this one at O'Hare Airport in 1993. This is the moving walkway leading to the United terminal. There are colorful neon lights lining the ceiling, and even the walls are lit up. The motion blur was caused by me holding the camera for about 1 second. If you look at the bottom center of the image, you'll notice eyes, nose and eyebrows. I did NOT do that. The image looks like a woman I went to college with, but she wasn't in the picture or anywhere on that roll of film, so double-exposure wasn't an option. You'll notice the eyes look like they're either closed or looking down. Also interesting is the fact that you can see several small question marks near the center of the photo. This has a logical explanation (hand-holding the camera for about 1 second), but it's strangely appropriate considering the mysterious face. If you can help me figure out how this may have happened, I'd be grateful. And if you can show me how to do it intentionally, maybe I can give Dorothy some competition in the untapped psychic photography market! Thanks for stopping by my blog Frank! 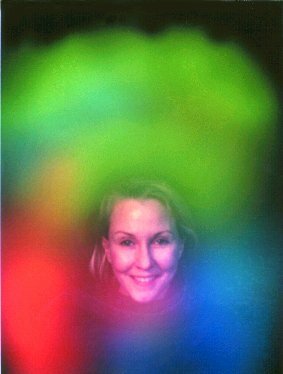 Aura photography? How does one go about doing that? I've returned to posting about photography, so please come and check out my latest photosafari post. I wasn't upset at your gentle ribbing of my work..because what you actually found were beautiful portraits of children and babies. So this 11th hour compliment may journey through the Blogiverse as a compliment indeed. Just to let you know, I "looked" at your picture on your site and got a strong feeling that we probably would gravitate towards each other at a party or opening, and end up talking--(and laughing) our asses off. Maybe one day we will get the chance to do so. I find that living as an openly-psychic person feels really natural and right for me. But I never really advertised it until recently. And now people I photographed are starting to ask me for readings and energy balancings. So now I do both, love both, and meet very, very interesting people from both. And now I've met you, too. Your photo is truly amazing. At first I thought it was a reflection in a window, but reading your explanation, i guess its "one of those things"
Though I cant tell you how it happened, what it means, or how to do it again, I can give you my thoughts. Did you ever call the woman? After reading your explanation I imagine you asking "whatever happened to that girl?" could be an interpretation of the question marks. Maybe she has something to tell you! I linked your post from my blog and I will ask a couple friends who've had similar experiences (not quite as shocking) maybe they can help you!